The strange cloud formation over Lipa. Image source: Jerwin Lasin on Facebook. 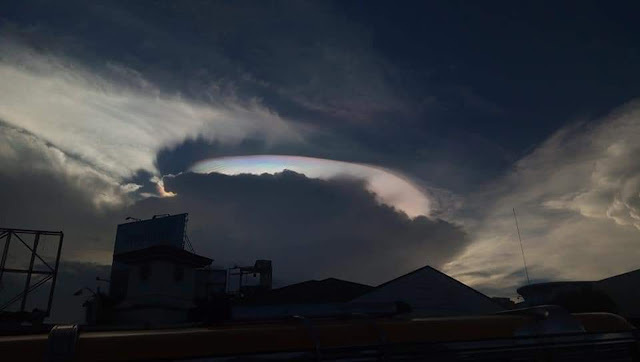 Just before five in the afternoon the other day, Wednesday, I chanced upon a picture (above) of a strange cloud formation southwest of Lipa City posted on social media by a former colleague at De la Salle Lipa. He had taken the picture from the front lobby of Robinson’s Place, the mall right next to the school. At first glance, the cloud formation looked not unlike those large alien spacecraft one sees in Hollywood-made extraterrestrial-themed movies. Apparently, there are even names for such cloud formations – the fallstreak hole, cavum, hole punch cloud, punch hold cloud, skypunch, cloud canal or cloud hole 1. Just nod your head and pretend you understood. Said Padre Pio, if the reader doesn’t already know, is Saint Pio of Pietreicina, known during his lifetime as the Capuchin friar who suffered stigmata with wounds that corresponded to those suffered by Jesus Christ during crucifixion. He was canonized as a saint in 2002 by Pope John Paul II2. After my former colleague pointed out his observation to me, yes I started to see what he meant. I have to say, however, that while I was raised Catholic, I have never been the sort to go overboard with my Catholicism. Thus, what I started to see in the cloud formation was a shape resembling the side view of the head of a man with a beard, no more. As the reader can see in the image below, I have flipped the original picture clockwise using graphics editing software and then superimposed an image of Saint Padre Pio. The contour of Padre Pio’s face doesn’t even come close to that of the cloud formation. The top image flipped clockwise and a face of Father Pio superimposed. This is a psychological phenomenon “in which the mind responds to a stimulus, usually an image or a sound, by perceiving a familiar pattern where none exists3.” In the case of the cloud formation and people’s associating it with the face of Padre Pio, the pareidolia was likely influenced by the fact that the incorrupt heart relic of the saint was in Lipa City at the time. This was more or less public knowledge. 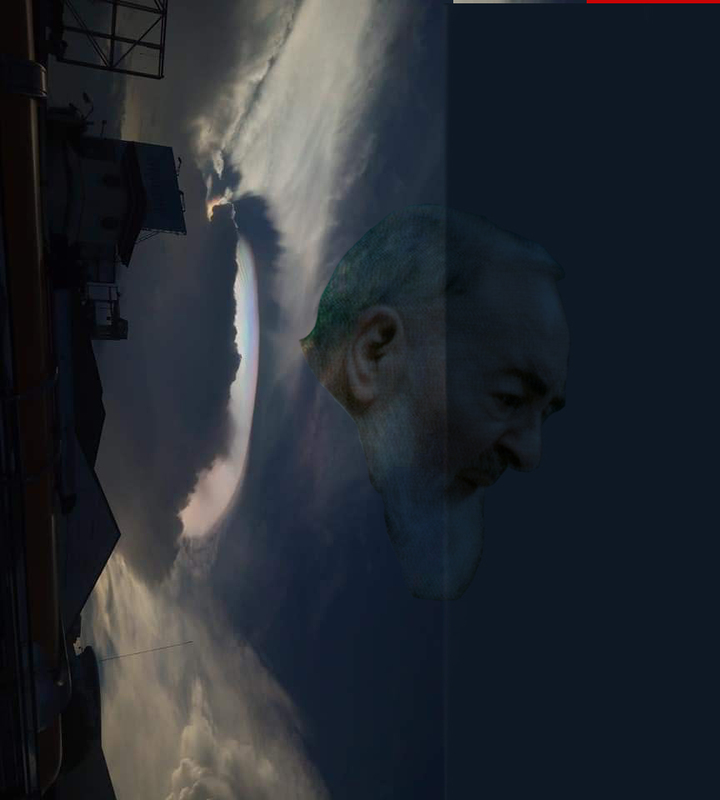 People were, in fact, seeing the likeness of Padre Pio in the cloud formation because their brains were making the connection, when in fact, as shown in the graphic, the likeness was not at all well-defined. In other words, the shape of the clouds, as rather tends to happen, was completely random. While we’re in the realm of science in trying to explain the fallstreak hole and why people would recognize a face in a completely random shape, it is nonetheless tempting to wander into the domain of probabilities. According to TV Patrol Southern Tagalog, the incorrupt heart of San Padre Pio was flown into Fernando Air Base around 9 o’clock in the morning of the same day when the cloud formations occurred. Fallstreak holes are rare phenomena according to some Internet resources I have browsed through. What are the chances of such a hole, rare as they already are, occurring to look like a halo above a cloud formation that, if not exactly shaped like the face of Padre Pio, is nonetheless recognizable as similar to the side view of a man with a beard? Also, what are the chances of a cloud formation shaped like the face of a bearded man occurring exactly on the day when a Padre Pio relic is visiting the city, thus making it easy for some people to make the association? The photograph below, embedded directly into this article from a Facebook page called Hello Lipa, tells a really compelling story. Personally, skepticism is built right into my DNA so that I don’t buy easily into religious mumbo-jumbo. But, perhaps, the logic of science ultimately becomes irrelevant depending on the depth of a person’s faith.